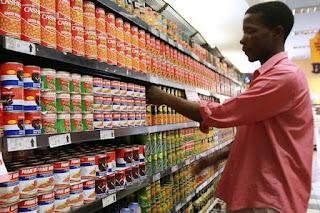 CONSUMERS have expressed shock after major supermarkets and small scale retailers once again increased prices of some basic commodities by margins of up to 75 percent. Despite the stability in the economy after the February Monetary Policy Statement, which has been widely endorsed by business, the latest price increases have put consumers in a corner, especially considering that most companies and Government have not increased salaries for their workers. Grocery items that include flour, rice, cooking oil, sugar, salad dressing, toiletries, washing powder, cereals and meat have been on an upward trajectory in small and major retail outlets recently. A snap survey conducted by Business Chronicle in the last three days has revealed that prices have gone up by 25 to 75 percent from the average prices of similar commodities last month. A two litre bottle of cooking oil, for instance, has gone up from an average of RTGS$7, 50 to RTGS$14 whilst a two kilogramme (kg) packet of chicken portions has gone up from RTGS$11 to RTGS$16. A 10kg bag of mealie-meal has gone up from RTGS$6 to RTGS$8, 50 while 500g margarine, which has suddenly been in low supply, has risen to about RTGS$22 from an average of RTGS$8. A closer comparison shows that prices for most basics have gone up by more than 400 percent between March-August last year and this year. The wanton price increases have sparked outrage among consumers, who have expressed their disgruntlement saying the cost of living was now beyond their reach given low wages and salaries they were earning. “These retailers are stealing from us by over pricing goods. Government must do something about it quickly before the situation gets out of hand. As a consumer I am slowly losing my buying power since my monthly salary does not tally with these exorbitant prices,” fumed Mrs Dorothy Phiri, a shopper at OK Zimbabwe in Bulawayo. Some consumers said prices were cheaper and more stable when one buys with foreign currency. They, however, said the new pricing system was not fair for them as they were not earning forex. “I have nowhere to get forex. However, when I go and buy it from the street and then do my groceries, sometimes I get better deals than when I use RTGS dollars directly at the supermarket. Something must be done about this currency issue as it is fuelling the parallel market,” said Mrs Nancy Mhoni who was shopping at a Choppies supermarket. Others said they preferred street vendors who sold grocery items at a price cheaper than supermarkets, but only accepted cash payment and mobile money payments at a premium. Commodities such as petroleum jelly, washing soap, body lotion, diapers, peanut butter, cereals, washing powder, bathing soap, rice and cooking oil mostly imported from South Africa are sold from pavements around the city. Commenting on the price increases, Confederation of Zimbabwean Industries (CZI) president, Mr Sifelani Jabangwe said they were due to the movement on the parallel market since the official market is offering rates that are very low for sellers. “The price increases are due to the continuous movement on the parallel market. The official market introduced in February by the Central Bank is offering rates that are very low for sellers,” he said. Mr Jabangwe said the price hikes are likely to be short term if the inter-bank market works to eliminate the parallel market.